Many boat owners are missing out on opportunities to earn extra cash (or make a living), letting their craft sit at a marina unused or setting sail without any paying passengers along for the ride. Captain’s licenses are required to legally carry “passengers for hire” — essentially, having a license enables you to book charters for things like fishing, sightseeing, or getting around town on the water. 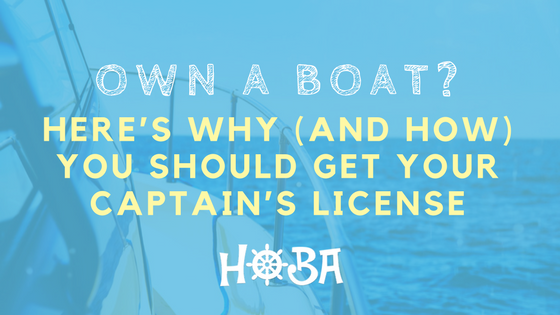 And once you have your captain’s license, you can register for HOBA and instantly turn your boat into a business at the touch of a button. While it might seem like an overwhelming process or not worth the hassle, a captain’s license really is worth it. Yes, you have to take a course (usually 7 to 10 days spread out over a few weeks), spend a bit of money upfront (the cost ranges from $500 to $800), and fill out some paperwork…but that’s a small investment when you think of all the money you’ll be able to make by booking charters on your boat. We know boat captains who recoup — and even triple or quadruple — their captain’s license fee in just one weekend of charters. Here’s how the captain’s licensing process works — and what you’ll need to do it. The Operator license is for uninspected vessels (ie: boats that hold up to 6 passengers, weigh up to 100 gross tons, and travel up to 100 miles offshore). These are sometimes called a 6-pack license (because Operator boats hold 6 people, not because your passengers can crush a 6-pack of beer…). The Master license is for inspected vessels (larger boats that can carry 7 or more passengers) that travel up to 200 miles offshore or on inland waters. 360 days on the water, with 90 of those days in the last three years (there are additional factors for the Master license, which you can read about on the US Coast Guard site here). The remainder of the process involves taking a captain’s license course, passing the comprehensive exam, and then getting your license from the US Coast Guard! Before you get SAT test-induced anxiety, let us break the process down for you. The captain’s license exam covers three general areas of knowledge: coastal navigation, deck knowledge, and “rules of the road.” Questions touch on things like safety, boat terminology, lights and sound signals, as well as tides, nautical charts, and boating regulations. There are plenty of example questions and practice tests online (click here to see questions straight from previous USCG exams). If you’re an avid boater, you likely already know a lot of this stuff. The captain’s license course will refresh your memory on more complicated topics like regulation and prepare you for the exam (which includes multiple choice, written questions, and plotting on a navigational chart). In order to get your license, you must score at least a 70% on the general portion of the test and at least 90% on the Rules of the Road section. If there’s not a USCG Regional Examination Center near where you live (there is one in downtown Charleston, SC), there are several approved course centers that offer both the class and the exam. You can check out several here, here, and here. And there you have it! Once you pass the exam, just send in your paperwork (or have your course center do it) to the US Coast Guard. In less than a couple of weeks, you should have shiny new captain’s license waiting in your mailbox. Plus, captain’s licenses last for five years. That’s five full years of earning money right from your boat. Ready to turn your boat into a business? Join our HOBA Captains group and get started today! Hop On a Boat Anywhere with the Uber of Boating. HOBA lets users book a boat trip on demand and helps boat captains grow their business.